Alonso Krangle LLP, an experienced defective medical device injury law firm, is investigating Da Vinci surgical robot complications and problems surrounding the Da Vinci Surgical Robot used in robotic surgeries on behalf of patients and their families who have been allegedly injured during surgical procedures and developed complications or problems in which the surgical robotic device was used. According to court filing, many of these Da Vinci Surgical Robot assisted surgeries required additional surgical repair. Da Vinci Surgical Robot Complications & Problems : More Marketing Hype than Surgical Necessity? The Da Vinci surgical robot was first sold in the United States in 2000 to assist in numerous surgical procedures including heart surgeries, prostate surgery, and hysterectomies. It is designed to increase a surgeon’s range of movement through laparoscopic incisions, resulting in decreased blood loss and shorter recoveries. Since its introduction, the device has been heavily marketed to hospitals and patients as part of what some call a ‘medical arms race.’ Four years ago, the device was in 853 hospitals and at costs between $1 million and $2.5 million, plus hundreds of thousands in yearly maintenance and replacement parts, it earned Intuitive Surgical $1.05 billion in sales in 2009 alone. By 2011, over 2,000 hospitals were using the Da Vinci robot, which has been deemed by some as a tool to attract patients, not necessarily to improve their care. Training is one issue that is being questioned. According to the Wall Street Journal, the manufacturer offers two surgeons from a hospital that purchases the device a two-day training course on how to use the Da Vinci robot, and from there, it’s up to the hospital to decide when surgeons are to able to use it unsupervised. In some hospitals, surgeons were able to use the device unsupervised after four surgeries, while at others surgeons performed hundreds of robot-assisted surgeries before going it alone. 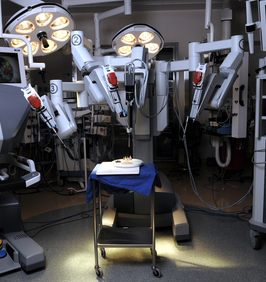 While the use of robotic-assisted surgeries has significantly increased in the last four years, data indicates that the benefits of their use is limited, while “cost and operative times are increased.” Further, experts are questioning the evidence regarding marketing practices and manufacturer influence on the wide spread use of these types of devices. In fact, one heart surgeon told the Seattle Times, What disturbs me is that we havent done the thing we always say we should do — which is look at a detailed, randomized trial across institutions to assess whether what were offering patients is better. Da Vinci Robot Problems and Complications being investigated by Alonso Krangle LLP as lawsuits continue to mount against manufacturer Intuitive Surgical alleging the device may cause serious injury and even death. At least nine lawsuits have been filed against Intuitive Surgical over the Da Vinci robot, including one filed by a father whose daughter died two weeks after a hysterectomy because of an alleged design flaw in the robot that allowed electrical current to jump and burn her intestines and an artery. If you or a loved one suffered serious Da Vinci surgical robot complications, including tears and burns to blood vessels, intestines and other internal organs, following a surgical procedure involving a Da Vinci Surgical Robot, you may be eligible to file a Da Vinci Surgical Robot Complications lawsuit seeking compensation from Intuitive Surgical. To learn more about the legal options available to you, please contact the Da Vinci Surgical Robot Complication lawyers at Alonso Krangle LLP by filling out our online form or calling us.